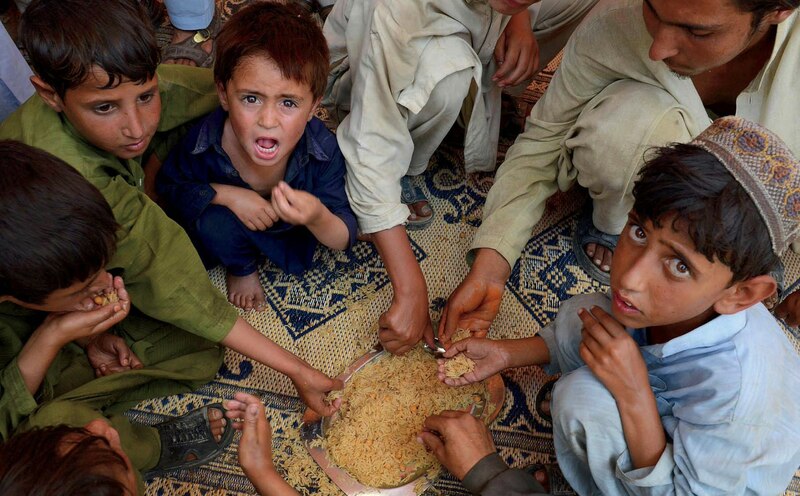 Pakistanis eating rice, a staple crop and major source of protein in South Asia. North Americans get most of their protein from animal-sourced foods, but most of the world relies on a handful of staple crops like wheat, rice, and corn. Climate change may alter the nutritional value of those crops, creating significant health risks, particularly in places where protein deficiency is already a problem (about 660 million people worldwide are affected). By 2050, a new study projects, 148 million more people, equivalent to 1.6 percent of the world’s projected population, will be at risk due solely to the impact of carbon dioxide on nutrients. More than a third of them live in India, where the population depends heavily on rice for protein; nations in sub-Saharan Africa and South America would also be seriously affected. The study, says senior author Samuel Myers, a principal research scientist at the Harvard T.H. Chan School of Public Health (HSPH), exemplifies an emerging field—planetary health—which has grown from the observation that “human activity is disrupting our planet to such a degree that it’s coming to be a primary driver of global health.” He directs the Planetary Health Alliance at HSPH. The study, co-authored by Danielle Medek, a former fellow at the University Center for the Environment, and professor of environmental epidemiology Joel Schwartz, builds on Myers’s 2014 meta-analysis of 143 different comparisons of staple crops, which found that climate change could significantly alter their nutritional value. That research, published in Nature, showed that carbon dioxide levels of about 550 parts per million (the current level hovers around 400 PPM) reduced the iron, zinc, and protein content in six staple crops grown over 10 years on three different continents. Protein levels decreased by 6.3 percent in wheat, and 7.8 percent in rice. “That means for exactly the same number of calories from rice, you’ll get less protein,” Myers explains—and more carbs. The researchers still don’t know what causes the changes in plants’ nutrient profile, he explains, because the original experiments on crop nutrients under different CO2 levels weren’t designed to uncover the mechanism. The simplest explanation, says Medek, a plant physiologist, is carbohydrate dilution: at higher levels of CO2, plants absorb carbon from the air and produce starches more efficiently, which might “dilute out” other nutrients. But the 2014 meta-analysis tested for levels of many different nutrients—selenium, boron, and others—in the crops grown throughout the test period and found that their concentrations didn’t decrease at similar rates; some of them even increased, suggesting that a more complicated process—perhaps in addition to carbohydrate dilution—is going on. Whatever the underlying mechanisms, the changing composition of crops might pose a risk not just to low-income countries, but to the developed world, too. The researchers cite evidence that increasing the ratio of carbs to protein in North American diets is linked to higher blood pressure and a higher risk of heart disease. Though that link is still speculative, Myers says, it suggests that more work is needed on the health impact of higher-carb diets in the West—and that changes in staple-crop nutrition could pose a challenge that goes beyond global malnutrition, to affect human health in other ways even as the world gets richer.